The competitors button opens up the menu where we manage competitors for the given event. 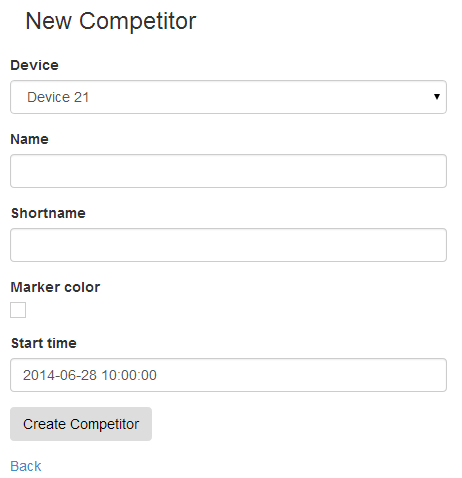 Inside we have a New Competitor button which we use to add a new competitor. Here you fill the required fields. We choose the GPS device from the "Device" dropdown. The full name of the competitor which will be visible on the left menu. Shortname will be visible alongside the marker on the map. "Marker color" is the color of the marker and tail. If you don't select a color, a random one will be chosen for you, which won't collide with the others if possible. "Start time" is the start time of the competitor in this format '2014-06-28 10:00:00'. If you don't know the start time leave it the same as the event start time. After we fill everything we click Create Competitor and we are done.